– Sohei Nakayama, Advisor, The Industrial Bank of Japan, Ltd.
– Tatsuzo Mizukami, President, Japan Foreign Trade Council, Inc.
Mar. 16, 1979 The Charter of establishment of the Foundation for the Establishment of the International University of Japan was issued. Jan. 16, 1982 The Charter of the Educational Foundation of the International University of Japan was approved. 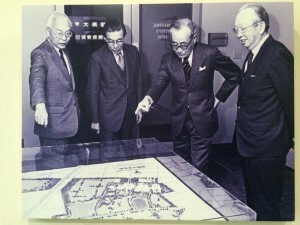 The International University of Japan and Graduate School of International Relations were established. As of this date, The Ministry of Education fully approves of, and accredits IUJ and GSIR as a Japanese private university under its authority. Apr. 1, 1982 The Graduate School of International Relations began to operate. Apr. 1, 1983 Students for the Graduate School of International Relations were accepted. Apr. 1, 1988 The Graduate School of International Management began to operate. Jun. 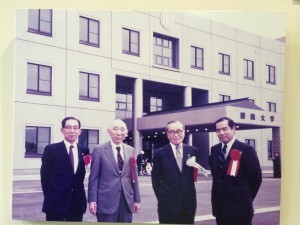 1, 1988 Matsushita Library & Information Center was established. Aug. 1, 1988 The International Management Research Institute was established. Sep. 1, 1988 Students for the Graduate School of International Management were accepted. Apr. 1, 1991 The Research Institute of Asian Development and the Global Communication Center were established. Sep. 1, 1995	 The Graduate School of International Relations reorganized its curriculum into two programs; International Relations Program and Inter-national Development Program. Sep. 1, 2001 Accepted the first Students for the E-Business Management program (One-year Master’s Degree program) of the Graduate School of International Management. Sep. 1, 2005 The International Peace Studies Program (IPSP) of the Graduate School of International Relations was started. Sep. 1, 2009 The Public Management and Policy Analysis Program (PMPP) of the Graduate School of International Relations was started. Sep. 1, 2010 The International Peace Studies Program (IPSP) of the Graduate School of International Relations was integrated into the International Relations Program (IRP). Sep. 1, 2013 The One-Year MBA of the Graduate School of International Management was started. Oct. 30, 2014 Establishment of the PhD Program of the Graduate School of International Relations was approved. Sept. 1, 2015 Accepted the first Students for the PhD Program of the Graduate School of International Relations. Sept. 2018 The Japanese Development Program (JDP) was started in both the Graduate School of International Relations (GSIR) and the Graduate School of International management.